The final year of the First World War is the one I struggle to understand the most in terms of the events of the year and how they fit together. Unravelling the complexities of the German Spring offensive; understanding why it ultimately failed; the impact of US troops arriving in Europe; and the final successes of the ‘100 days’ offensive – a lot happened during the year which also have to be put in context of the events that preceded them. Pitt was certainly a popular historian (as opposed to an academic one); he was a protégé of Liddell Hart and worked as a researcher on the seminal BBC series ‘The Great War.’ This book was first published in 1962 and was one of the first books to specifically tackle the events of 1918. 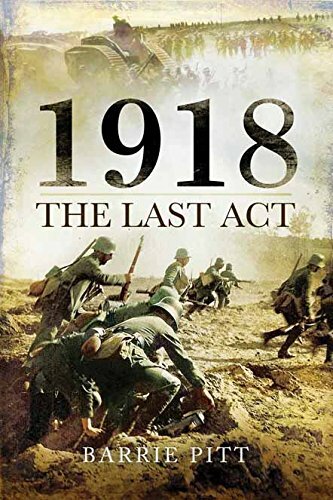 A concise introduction summarises the events of the war up to the beginning of the year, with an examination of the situation on the western and home fronts, before launching into the chronology of 1918. Whilst the narrative of events may have largely stood the test of time, some of Pitt’s views are quite dated (at least to readers with a more recent and rounded knowledge of the conflict); a sign of the era in which it was written and obviously lacking the benefits of all the research that has taken place since and the new records that have become available. For example Pitt does not recognise any change in British tactics during the war. Some of his statements are quite sweeping and general, particularly concerning civilian morale and conditions, and words such as ‘slaughtered’ and ‘butchered’ appear all too frequently when describing the western front, reinforcing the myth that death or injury was almost inevitable for every soldier. Many of the stories recounted are at best anecdotal and at worst apocryphal; a bugbear is the lack of comprehensive referencing; again a sign of its time but nevertheless frustrating. Pitt has a propensity to recount stories without seemingly consulting primary sources to corroborate them (for example an account of a supposed massacre of a British unit near Valenciennes on 11th November 1918). This is perhaps indicative of his early journalistic career in creative writing and perhaps not wanting to let the truth get in the way of a good story. Although this is a reprint rather than a revised edition, the book would have benefited from an editorial introduction to provide some context both on the content and the historiography. Pitt was certainly a gifted storyteller and I found the book a great deal easier to read than some of the other rather impenetrable tomes on 1918. Overall a solid account of the final year but one that has to be read with the context in which it was written firmly in mind.